War knows no religion, race, gender or social status. It destroys everything and everybody with equal tenacity. When Olanna and her sister Kaneine are caught in the war, they find themselves completely helpless. In spite of their sound social and economic status and education, their plight seems no different from the uneducated houseboy Ugwu who has seen nothing but abject poverty all his life. As all of them face the brutalities of war with all their might, they struggle to maintain their sanity despite the gory violence being shed upon their friends, families and community. Odenigbo, Ugwu’s master and Olanna’s life partner, sees Biafra as a new beginning and believes in the future that it promises for the state. However, he fails to fathom the cost of it. They lose their comfortable abode overnight and are forced to live as refugees, running for cover every time an air-bomber shells their neighborhood. Richard, Kaneine’s English boyfriend, continues to face ridicule and resistance. But he finds himself more connected to the country of his residence than his roots of the past. Adichie’s book is a masterpiece. It takes you along the journey of ups and downs; of pleasures and absolute dejections; of feeling completely helpless to finding the strength within. The transformation of a naïve village boy who found pleasure in cooking for his master to a soldier of the civil war who raped girls and killed people cold-heartedly, is heartbreaking. The bond between sisters which was lost in the times of abundance revives in tough times and brings them together. 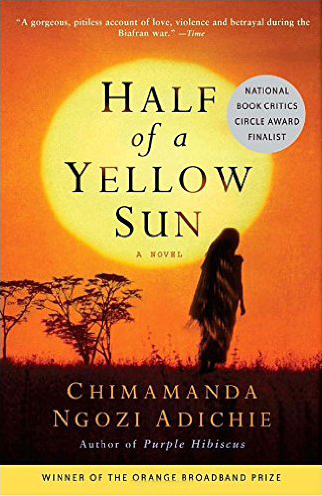 Half of a Yellow Sun takes a plunge into emotions, predicaments, redemptions and pain. There is a reasonable yet sensitive human angle to issues, personal and social. Some portions are worth reading twice, just to devour the beauty of writing. This is undoubtedly one of the best books I have ever read.